@lizwise05 First prize: A copy of The Mistletoe Promise by Richard Paul Evans. 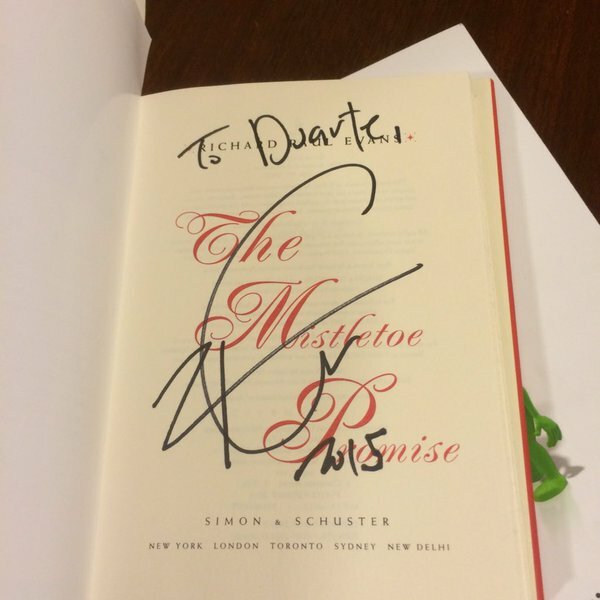 This copy is signed by the author and personalized “to Duarte.” We will also send you a candy pairing. @lisaeckstein Second prize: A used copy of Black Hills by Nora Roberts and a candy pairing. @narigonia Third prize: A (very) used copy of Whisper of Death by Christopher Pike and a candy pairing. And thanks so much to everyone who entered! We loved reading all your entries. They helped patch the hole in our soul that was eroded by reading The Christmas Sweater. We hope you all have a happy holiday season and receive only enjoyable books as gifts! 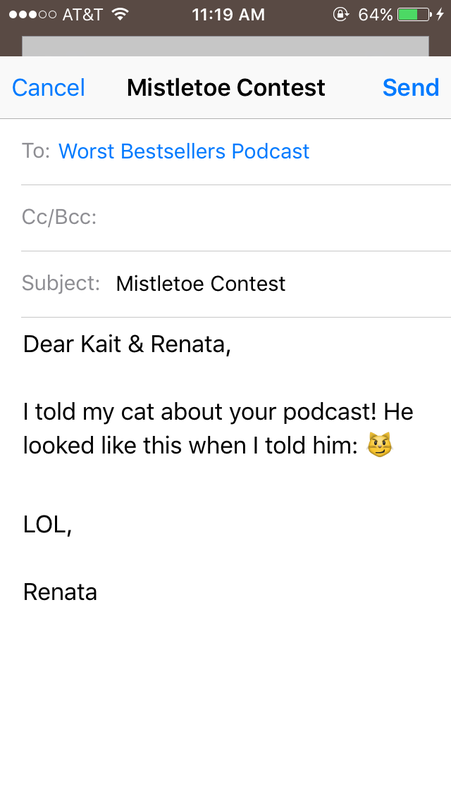 Happy holiday season, Best Listeners! 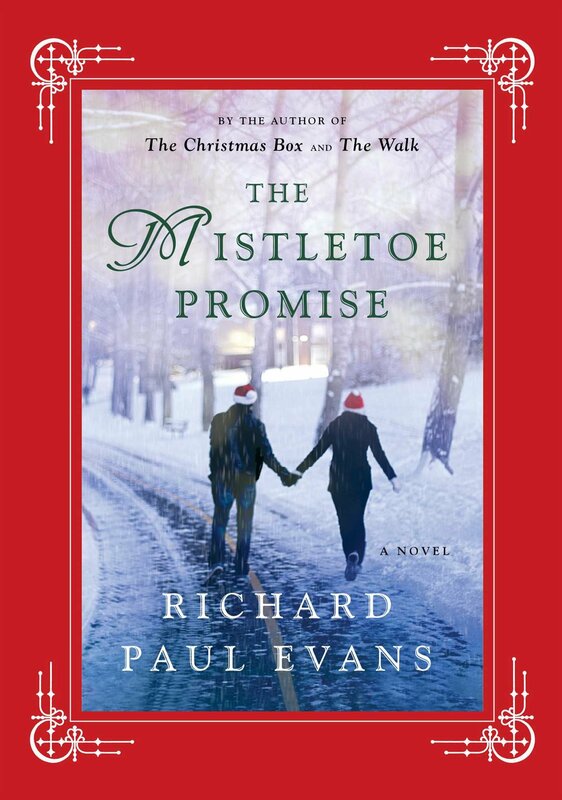 Having read The Mistletoe Promise, we’re so overcome with glad tidings of the season that we wanted to follow in the footsteps of Richard Paul Evans’s character Nicholas and shower everyone with expensive gifts and important cultural experiences. But we don’t have fictional lawyer money here, so instead we’re doing this contest. We want you to give someone you know the best gift of all: knowledge of our podcast. Just tell someone (or multiple someones, such as all of your Twitter followers!) 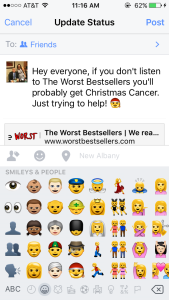 about Worst Bestsellers. Maybe suggest your favorite episode, or link to your favorite readers advisory page. 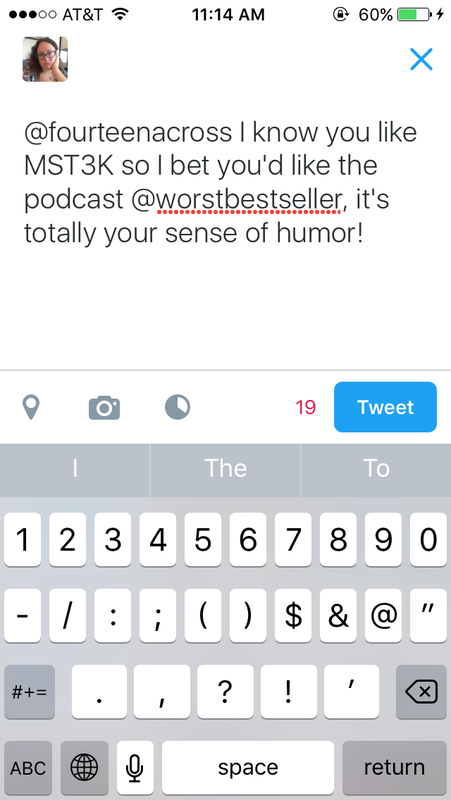 Maybe just a simple, factual statement: The Worst Bestsellers is a podcast that exists. Whatever you’d like to share about us is fine. Then let us know about it. If you’ve publicly tweeted about us, just include our Twitter handle @worstbestseller in your tweet and we’ll see it and count it as an entry. 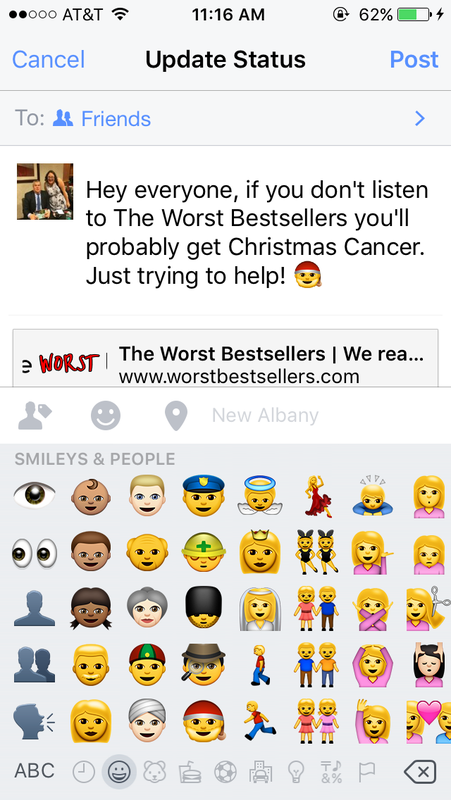 If you have a locked Twitter account, or if you’ve mentioned us on Facebook, Tumblr, Instagram, or any other social media platform, please take a screencap and email it to us at worstbestsellers at gmail.com with the subject line “Mistletoe Contest.” If you told someone about us in person, please email us your best emoticon representation of what that person’s face looked like when you told them. These entries are all invalid because they are all from Renata, but would otherwise be acceptable. Each method of telling people about us will count as one entry in our contest. (So, for example, you could tweet about us, post about us on Facebook, and tell someone in person for 3 total entries, but if you tweeted about us 3 times, that would just be 1 entry). You can submit entries any time between Monday, December 7, 2015 through Sunday, December 20th, 2015 at midnight (EST). Then we’ll put all your names in RandomPicker.com and choose three winners! Winners will be notified Monday, December 21st. We can’t believe Duarte is willing to part with this. That time Renata met Richard Paul Evans. 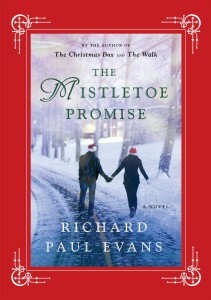 First prize: A copy of The Mistletoe Promise by Richard Paul Evans. This copy is signed by the author and personalized “to Duarte.”* We will also send you a candy pairing. Second prize: A used copy of Black Hills by Nora Roberts and a candy pairing. Third prize: A (very) used copy of Whisper of Death by Christopher Pike and a candy pairing. 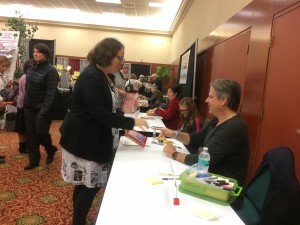 * FAQ on this: Renata met Richard Paul Evans at a librarian conference. 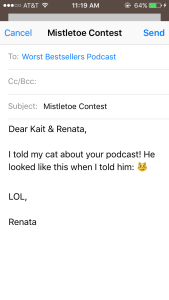 No, she did not tell him it was for a podcast, or that Duarte is a cat. It was a very cordial exchange. ** A note on the candy pairings: before sending out the prizes, we will contact the winners to check about allergies and candy preferences, but we’ll try to find something you would like that is thematically appropriate to the book. Fine print: We’ll contact the winners to get their shipping addresses, so you don’t need to include that with your entries–we’ll get ahold of you at either the Twitter handle or email address you contacted us with to enter. If we don’t hear back from you after a reasonable amount of time (say a few weeks-ish), we’ll draw a replacement winner. We’ll mail things internationally, so you don’t need to live in the US to win. You do need to live in this dimension, so most Christopher Pike characters are ineligible. 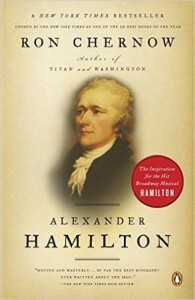 These copies were purchased by us as individuals and were not provided by the publishers. THANKS FOR NOTHING, PUBLISHERS. The only limit on entries is, we guess, the number of social media accounts you have at your disposal? We’ve never done this before so hopefully this all works out! We reserve the right to change the rules if something starts to seem shady. Kait, Renata, and their returning guest Caitlin read The Mistletoe Promise by Richard Paul Evans and unanimously agreed: it’s not nearly as bad as The Christmas Sweater was! In fact we actually… kinda liked The Mistletoe Promise? We liked it almost as much as the heroine of this book likes sweet pork salads, which is a lot. Listen now to hear us learn what exactly a sweet pork salad is, plus an important moral lesson (but not the lesson we were expecting to learn). Content warning: This book contains infant death, and so does our discussion of it. Special note: We’re having a contest and the grand prize is a signed copy of The Mistletoe Promise. Click here for details on how to enter! Candy pairing: Caitlin says Necco wafers, Kait says peppermint bark, Renata says kettle korn.